It is not a surprise for our dear readers that in their attempt to proof Wilayah of Ahlalbayt shias during the history accused many people in nasb, kufr and other things. And prophet Yunus (alaihi salam) is another example of fact how far shias can go in their attempts! Hadith 1 – (chain) from Habbatul Ureni: Сommander of faithful (Ali) said: Allah brought my wilayah to the inhabitants of heaven and inhabitants of earth, accepted the one who accepted, and rejected the one who rejected. AND IT WAS REJECTED BY YUNUS, AND ALLAH TRAPPED HIM IN THE BELLY OF FISH, TILL HE ACCEPTED IT. Comment: In accordance to agreed opinion of all shias, the rejecter of Wilayah is kaafir! And just see how shias dare to accuse prophet Yunus in disbelief!!!! 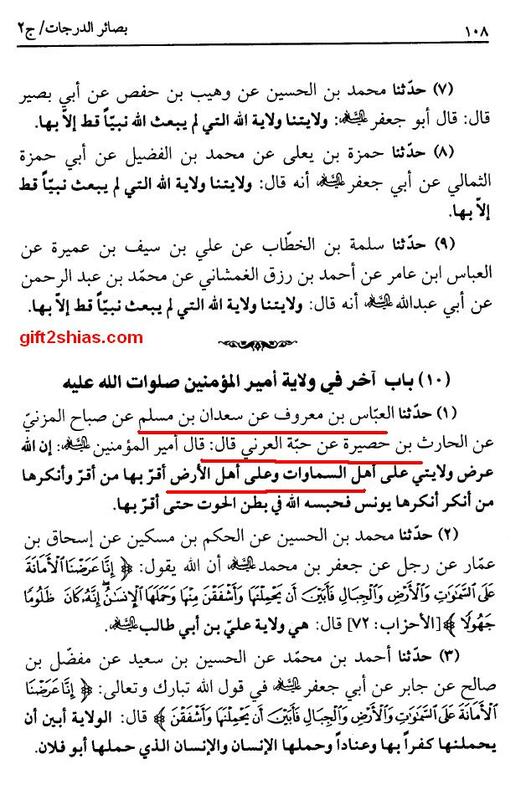 This entry was posted in Something really ugly, Take a few minutes to think on this, Their belief in prophets by Gift2Shias. Bookmark the permalink. Reblogged this on Muslim sects and heretics.